Secret Student, High Five Hands, Carpet Behavior, and Ray Warrior Coins - Welcome to Kindergarten! Before school starts each day I put a name in our Secret Student Bucket. Then before we leave for the day I take the name out. 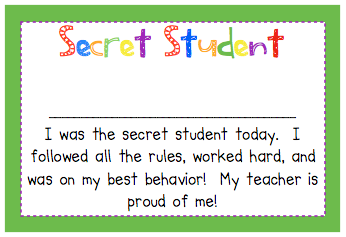 If that student has had a good day following directions and doing their best they are named Secret Student. They get the paper with their name and a prize from our prize bin. 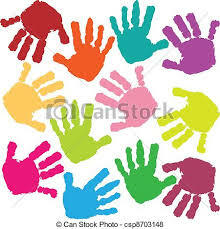 Each student had their own High Five Hand on the wall. They make their own hand by tracing it on paper, cutting it out, putting their name on it, and decorating it. When a student is "caught being good" in the classroom they earn a sticker for their hand. Once they earn five stickers they get a prize and their hand. They then get to make a new one. 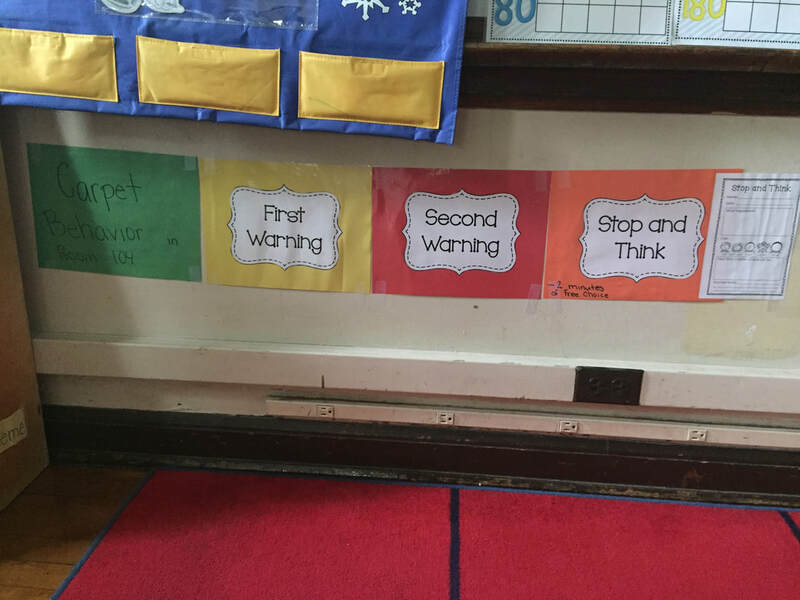 This is the behavior system we are using in the kindergarten classrooms during our carpet learning time. If a student is not following directions (ex: talking to people, interrupting the lesson, calling out, trying to play...) they will be given a nonverbal warning by me. I will look at them and do either the sign language sign for focus or stop (both of which they know) and hold up one finger. This is their first warning. If the behavior continues, I will do the stop or focus sign again and hold up two fingers. This is their second warning. If this continues then the student will be on Stop and Think. They will have to fill out a stop and think card where they draw/write their behavior and how it made them feel. They will draw/write a better choice they could have made and the bottom has a place for the teacher to describe the behavior. It will then be sent home for you to look at. Our Second Step (Social Emotional) curriculum teaches us strategies for staying on task when distracted by other. The carpet is a great place place for students to use this learning. We learn about ignoring the inappropriate behavior of others and using self talk to make good choices and stay on task. 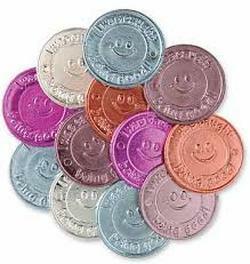 As part of our PBIS program, students can earn Ray Warrior Coins in the hallways, lunchroom, and recess. Students may spend their coins to purchase prize tickets I have in the classroom. The tickets are for things like eating lunch with me, bringing a stuffed animal to school, sitting in your favorite spot, bringing in a book to be read to the class, etc.